Fisher Space Pen has been an innovative American writing company since the early 1950s. In 1953, Paul Fisher invented the first “universal refill” which could be used in most ball point pens. However, always eager to discover the next great pen invention, Fisher went on to invent the first pressurized ballpoint refill. The refill was an overnight sensation. Made of a special semisolid ink and then pressurized with nitrogen, Fisher’s pressurized refill was guaranteed to write upside-down, underwater and was dependable in extreme temperatures of hot and cold. However, with the dawn of the NASA space age, the Fisher Space Pen was about to make history alongside American astronauts and space shuttles. 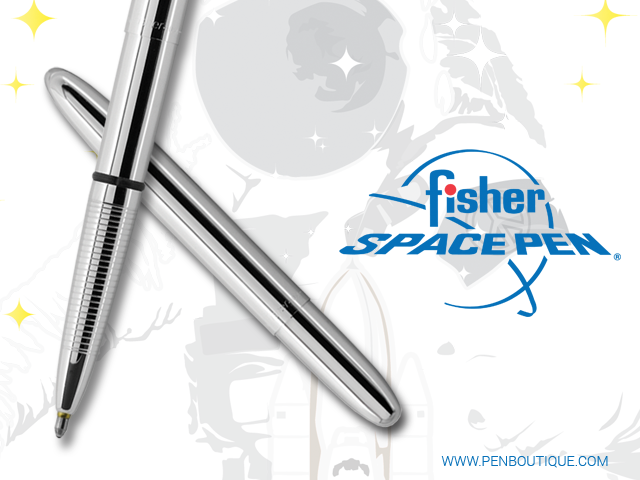 Beginning with the Apollo 7 mission in 1968, Fisher Pen has become the standard writing instruments used by American astronauts in space. NASA originally purchased 400 of the pens at $6 each. The Soviets followed as well. Some fans of Fisher Space pens like the line for the various vibrant colors offered, some are keen on the space exploration association, and others prefer the functional stylus. A group of fans request the clip, where others are clip-less disciples. Whatever your preference, Fisher’s bullet pens are the perfect size to carry in your wallet, pocket, purse, car glove box, organizer or toolbox. With the cap posted it's a full sized, evenly balanced writing instrument.